Dell PowerVault MD3000i iSCSI SAN Array and MD1000 Array 60TB SAS Storage. All of our systems can be built to order and custom configured to your exact specifications. For details and order arrangements. All of our products are tested and built to custom specifications. Offers custom IT solutions to build and operate complete physical and virtual infrastructures. Powered by SixBit's eCommerce Solution. 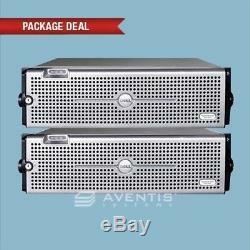 The item "Dell PowerVault MD3000i iSCSI SAN Array and MD1000 Array 60TB SAS Storage" is in sale since Friday, May 20, 2016.